This blog is my report from the 6th International Conference on Fetal Alcohol Spectrum Disorder in Vancouver in March 2015. Alcohol. It makes us merry, loosens social constraints. It’s sold to us in a bewildering array of forms and is marketed incessantly to us as soon as we can legally drink. However, it is arguably the most abused drug in the world. Excess alcohol damages our brain, heart, liver, pancreas and immune system and causes a variety of cancers. According to the World Health Organisation, 3.3. million deaths every year are attributable to alcohol abuse and 139 million years of healthy life is lost worldwide. Drinking rates are rising, especially in women. According to prizewinning author and recovered alcoholic Ann Dowsett Johnston, some female students are now playing drinking games of “competitive blacking out” and some women are now getting chronic liver disease in their 20s. Moreover, these trends are not confined to any single socioeconomic group. At the heart of the problem, women are drinking alcohol as self-medication for depression, anxiety, loneliness, trauma and abuse. As Ann says, “alcohol is the modern woman’s steroid”. This is sounding alarm bells because half of all pregnancies are unplanned and when consumed in excess in pregnancy, alcohol causes malformation of the embryo. From just 3-4 weeks old, a 1mm embryo is susceptible to alcohol even before a woman may know she is pregnant. As a result, a child is born every 30 seconds with a major brain disorder due to prenatal alcohol exposure (source, Denis Lamblin). Brain disorders form part of the diagnosis of fetal alcohol spectrum disorders (FASD), which is an umbrella term covering the spectrum of physical, behavioural and developmental outcomes that may occur after exposure to alcohol in the womb. 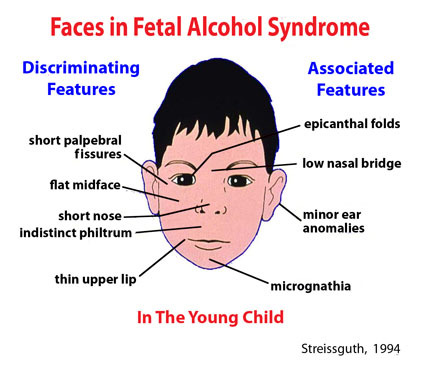 Children with FASD have recognisable facial characteristics, such as a thin upper lip, small lower jaw, short nose, a flat midface and an indistinct philtrum, the groove that runs from the nose to the mouth. Latest research has shown that alcohol slows down the development of a structure that forms during human development, called the neural crest, which gives rise to a diverse cells including the muscles and bones of the face and the certain parts of the brain. It effectively slows down development of all these structures meaning that they are often incompletely formed. What stood out for me at this conference was that delegates represented all stakeholders: researchers, doctors, social workers and even those directly affected by FASD. This gave the conference an emotionally-charged atmosphere. There was laughter and there were tears. We heard from Ann Dowsett Johnston that there are many reasons why a woman drinks even after she has discovered she is pregnant. Apart from the reasons mentioned above, women cite peer pressure, social norms and, as we have heard, pressure from their partners. One counsellor told me that one woman said that she couldn’t quit because her husband had told her that if she did, he would go with another woman. We heard of the many advances being made into characterising FASD using tools such as magnetic resonance imaging (MRI) , which showed that alcohol slows down the flow of “traffic” along the brain’s “superhighways” that connect different brain regions (Michael Charness and Kristina Uban). We saw the latest three dimensional facial scan data from Peter Hammond. We also saw how the two types of data can be superimposed and how studying developing rats could aid in our understanding of how FASD develops. Joanne Weinberg presented data showing that prenatal alcohol exposure in offspring of rats showing twice the human legal limit for driving resulted in prolonged inflammatory responses to infection, even as adults. 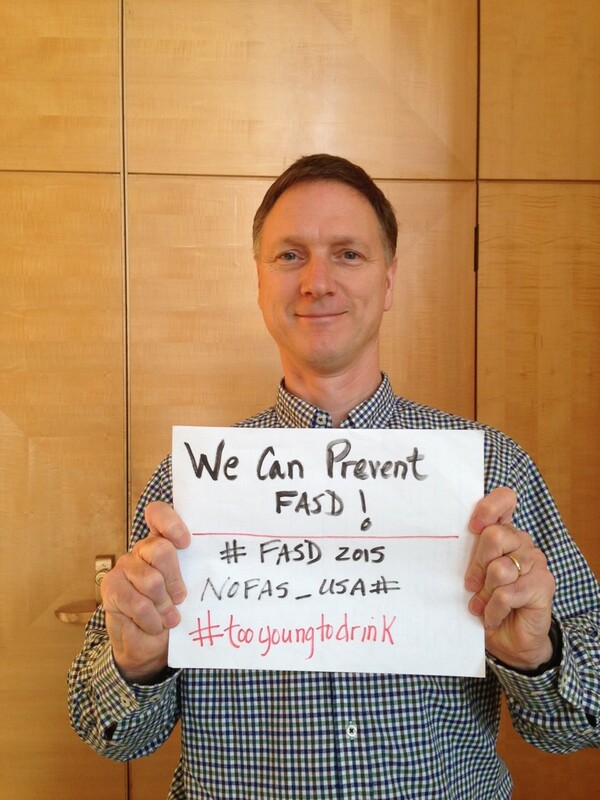 This may reflect that children with FASD have a higher risk of immune disorders. The brain has its own immune system and its own immune cells – the microglia, which ‘tidy up’ neurons that are “past their sell-by date”. Fulton Crews showed that alcohol exposure renders more neurons inactive and mobilise many more microglia than usual, thus disturbing the status quo in the brain’s immune system. Another exciting topic presented was how environments can interact with genetic sequences. We are all carrying genetic ‘risk’ variants that are only ‘activated’ when you encounter a specific environment. Thus, genetic knowledge could eventually lead to avoiding specific environments. Tatiana Faroud showed a couple of examples that she has discovered. Canadian researcher Michael Kobor presented unpublished data of how alcohol can get “under the skin” and change epigenetic dimmer switches controlling gene activity. In an exciting development, Cynthia Kane found that an anti-diabetes drug can prevent immune activation in the brain in an animal model, showing a faint glimmer of hope for future treatments in humans. A great success story came from here in Australia. 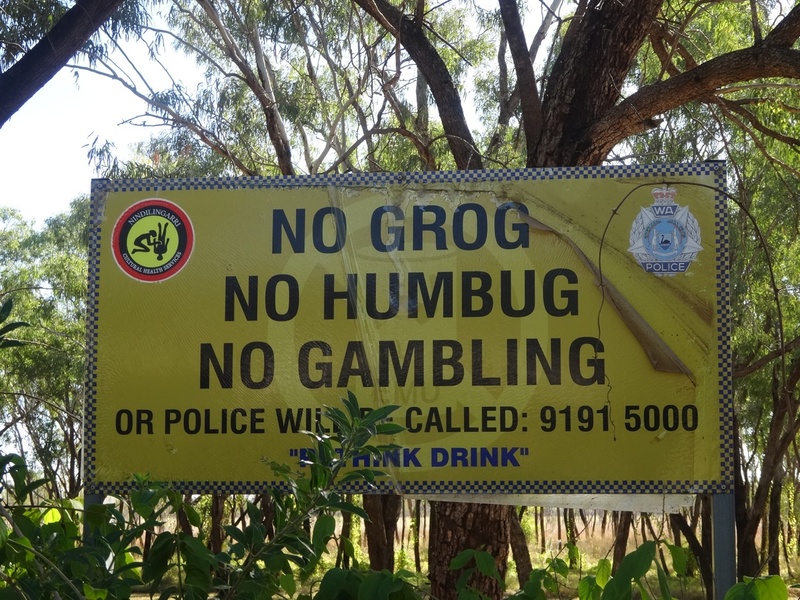 June Oscar told the amazing story of how, in the remote Western Australian town of Fitzroy crossing, she mobilised the local aboriginal community to rise up and say “enough is enough” to the high rate of FASD and alcohol-related violence, ill-health and suicide. In the Lililwan (“all our little ones”) project, she achieved a change in liquor licencing laws, and was successful at getting rid of “cowboy cops” from the police force, all despite encountering vilification, threats and ignorance. June helped establish the Marulu (“precious and worth nurturing”) Unit that offers help to parents and caregivers of FASD children and promotes a “no alcohol” messages. We heard from paediatricians James Fiztpatrick and Liz Elliott on how things are slowly being turned around, for example the proportion of healthy birth weight babies is rising. However, there is much still to do, and all despite the government refusing to continue funding the project. James eloquently and passionately talks about the issue in this TED talk. We heard a similar story from Carolyn Hartness, a Native American, who is revising traditional cultural practices to help heal the “soul wound” of past social injustices, helping to tackle the root of the problem of alcohol abuse. Her culture taught her that “we are all responsible for the health of the next seven generations” and recommended “Even if you don’t care enough about yourself, care for the next generation”. These messages wee echoed by the presence of multiple support groups who were given ample space among the commercial stands, which is a rarity at conferences. One of the most powerful campaigns was the “Too young to drink” campaign by Fabrica. Support groups also used the power of social media to share their message, as illustrated by Yours Truly. All-in-all, this was a great conference in which I was immersed in the subject matter that I am currently studying. It made me understand the problem and the reasons why research can eventually lead back to the community.